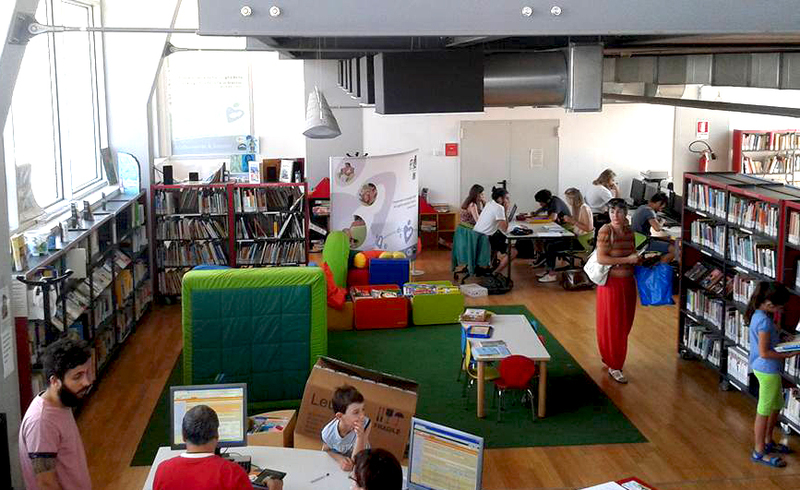 MimmaMà Point is a welcoming, emotional and comfortable area dedicated to breastfeeding, where mothers cuddle, breastfeed or reassure their children even in very attended places. Those light, self-supporting and safe stands do not overturn. They envelop the mother in a small, intimate and relaxing place, separating, but not isolating, her from the outside world. 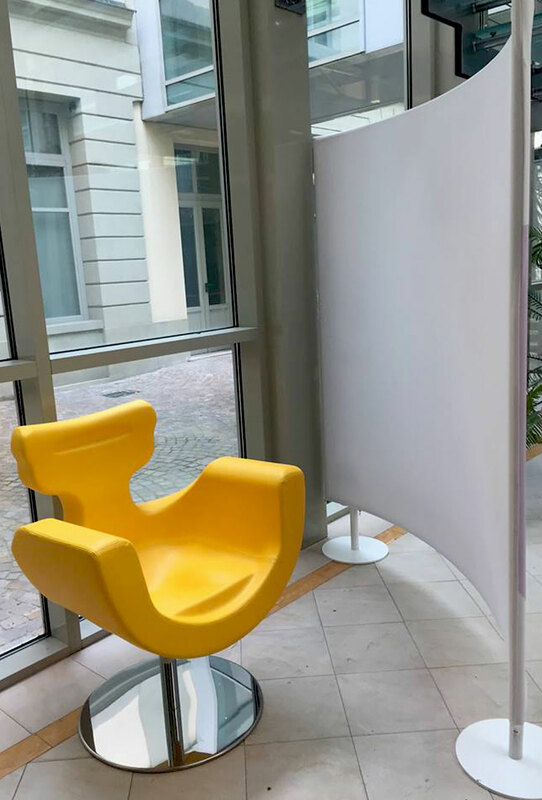 The MimmaMà Point stands and screens are made of easily mountable aluminum tubes assembled with internal screws system, upholstered with washable stretch fabric which is customizable with graphics. 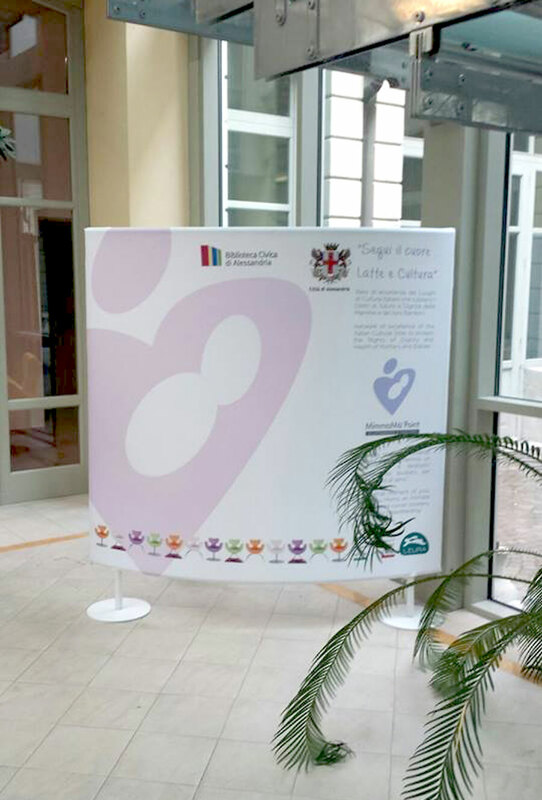 Breastfeeding spaces customizable in shape, sizes and graphics. 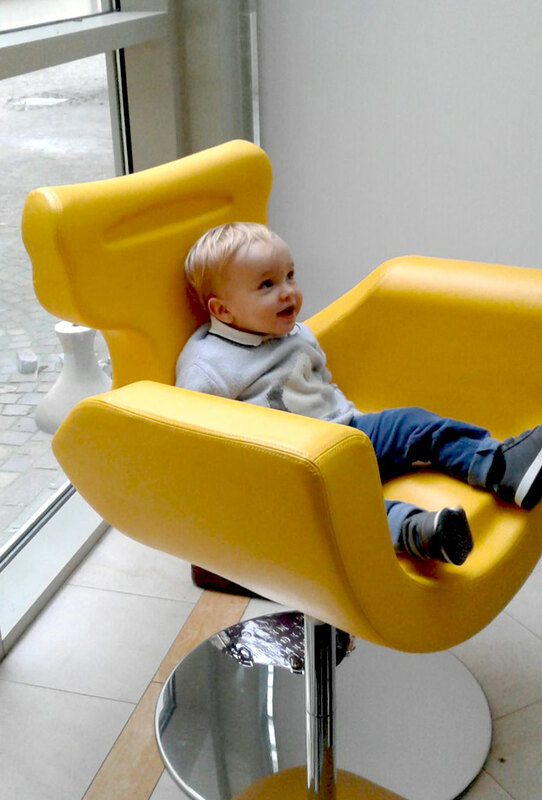 MimmaMà Point is a project created by the architect Mitzi Bollani to extend and complete the benefits of the MimmaMà chair. 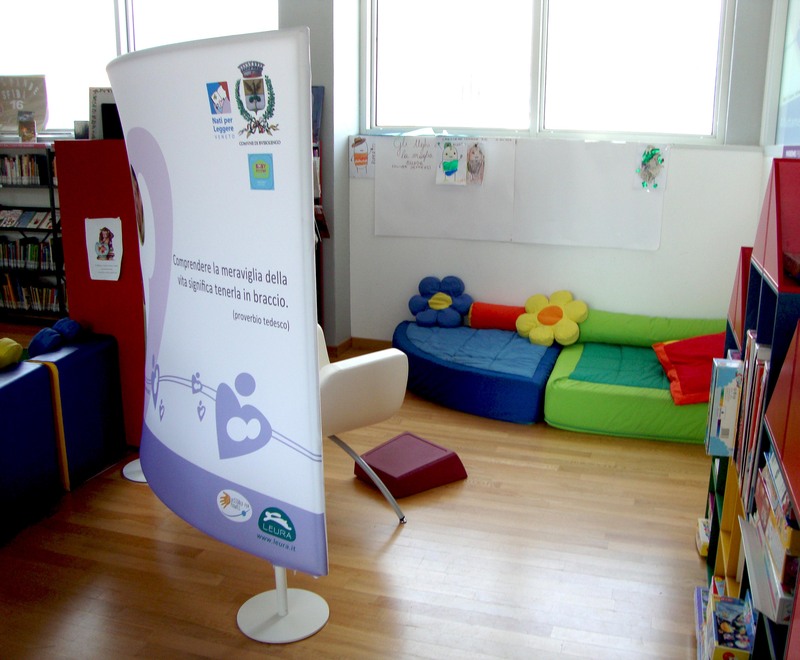 It offers a safe, clean, haven-equipped area for nursing baby or simply holding and cuddling it. 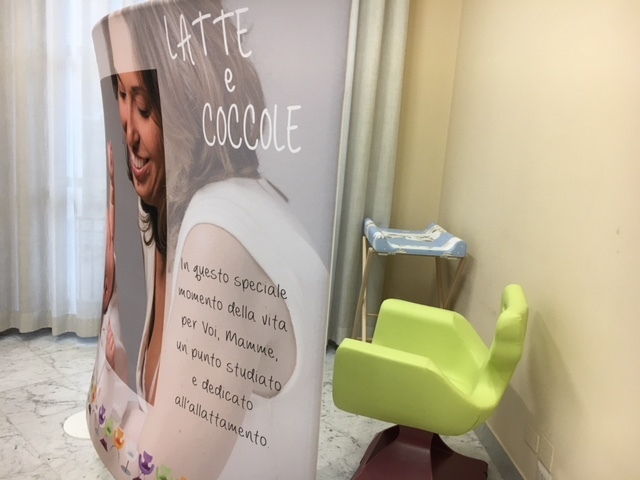 In MimmaMà Point mothers could find the nursing chair MimmaMà, a convenient baby-changer and NiDondolino, a revolving cradle game to amuse babies. 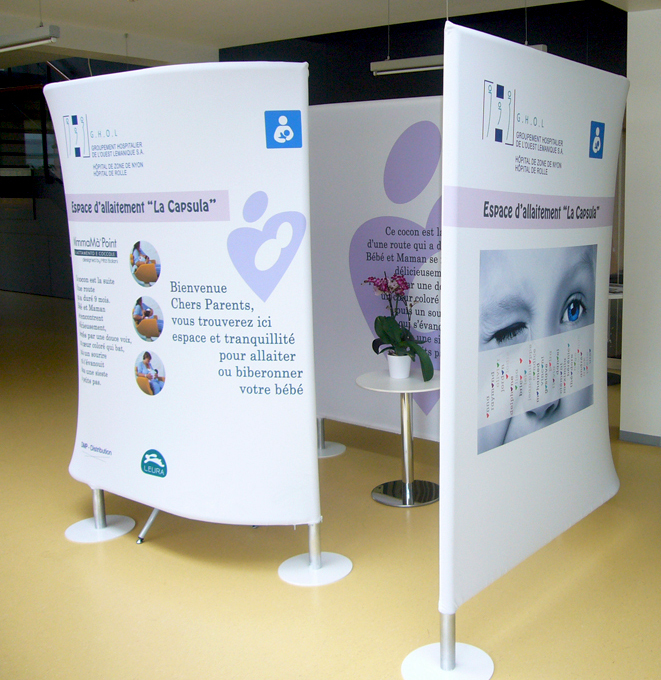 These stands allow the maximum peace and quiet: every baby has its own rhythm of feeds, impossible to programme as duration and quantity, newborns feeds up to 10-18 times per day. MimmaMà Point created by Leura s.r.l. is an added value for venues which host it. 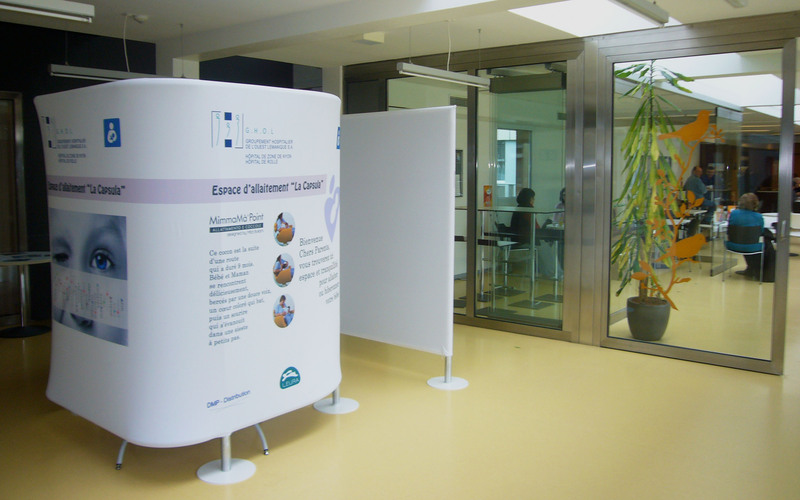 Stands and screens could be personalized with logos, to attract attention and encourage sponsorship. 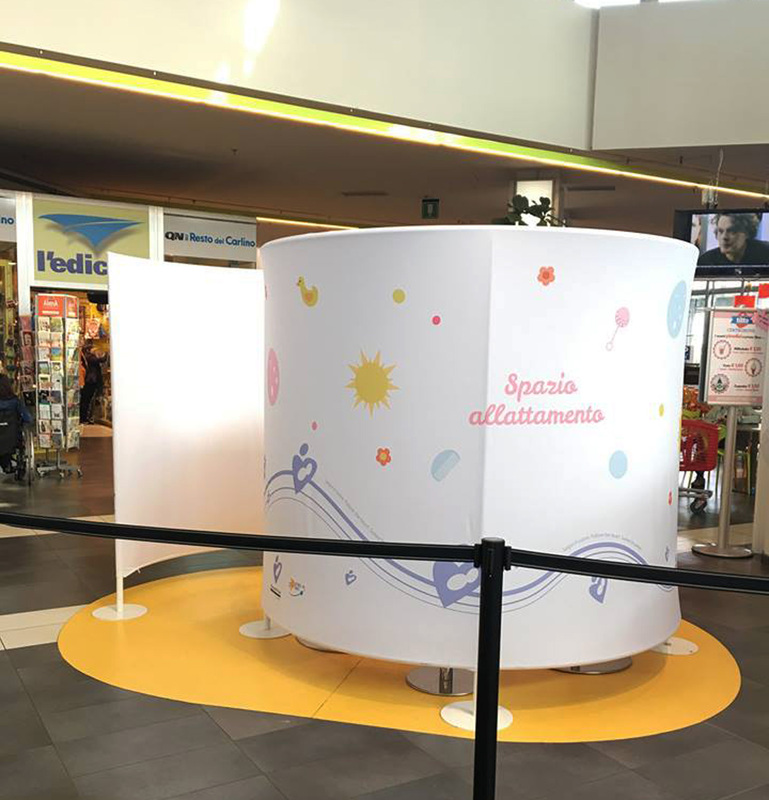 According to its dimensions and typology, MimmaMà Point adapts to any space to accomodate mothers and babies outside home. Crowded places are the least suitable areas for such an intimate moment but they do have advantage of being able to help mothers and babies. 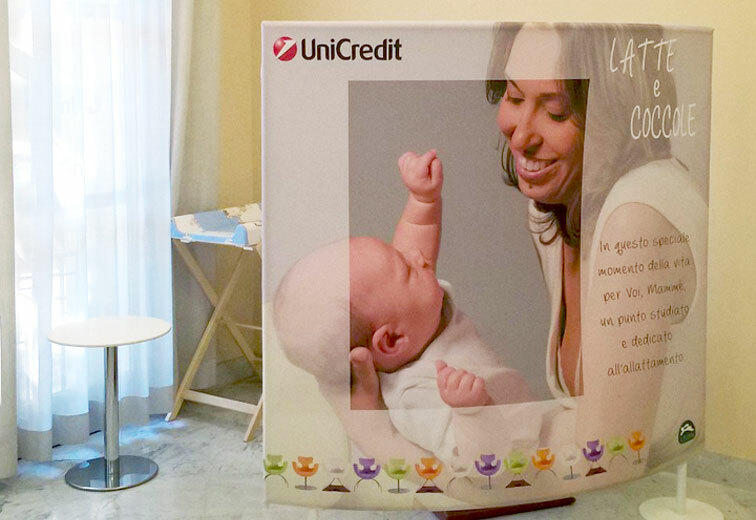 MimmaMà Point offers a service: socially useful, high profile, making life easier for mother and baby. It is an investment paying for itself over time and enhancing your reputation by word of mouth. 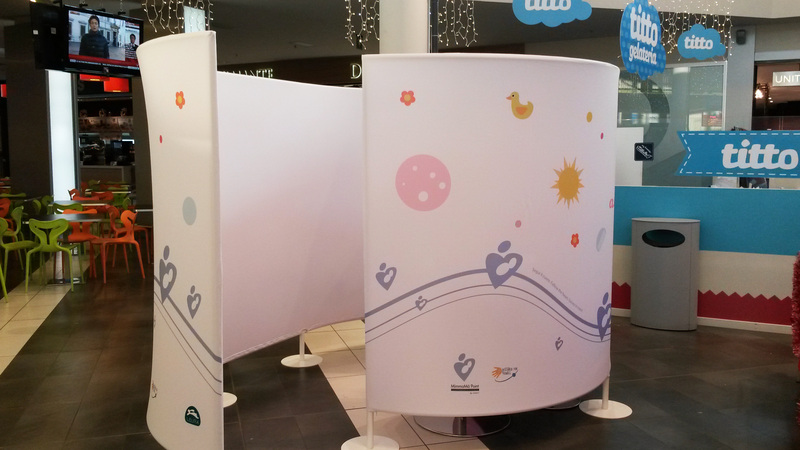 MimmaMà Point - a certified breastfeeding area ensuring comfort, privacy, cleanliness, functionality and safety. 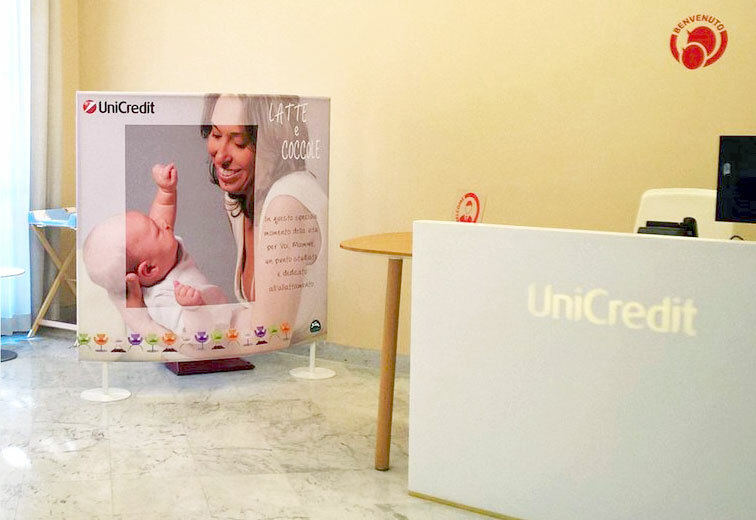 The first months in a baby's life are unique: they allow the child to start copyng with its surroundings, establishing a relationship with the most important person. Even if we do not remember suckling from our mother's breast, it remains one of the most intense experience of our lives. 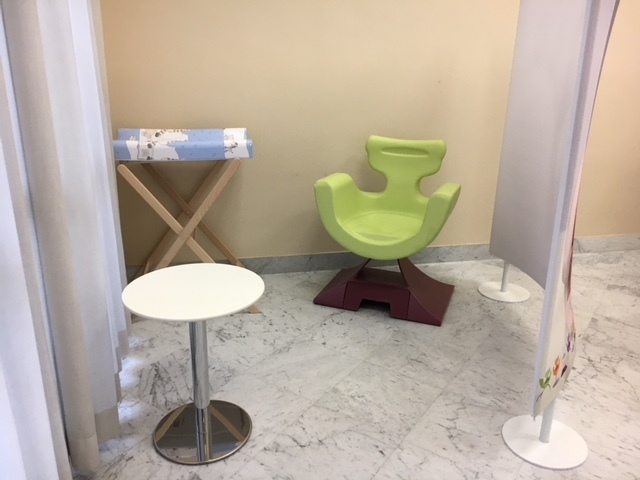 Hygiene, privacy, user friendliness and safery in a space dedicated to nursing mothers are guaranteed by MimmaMà point: the excellent solution of Mother Friendly Design. 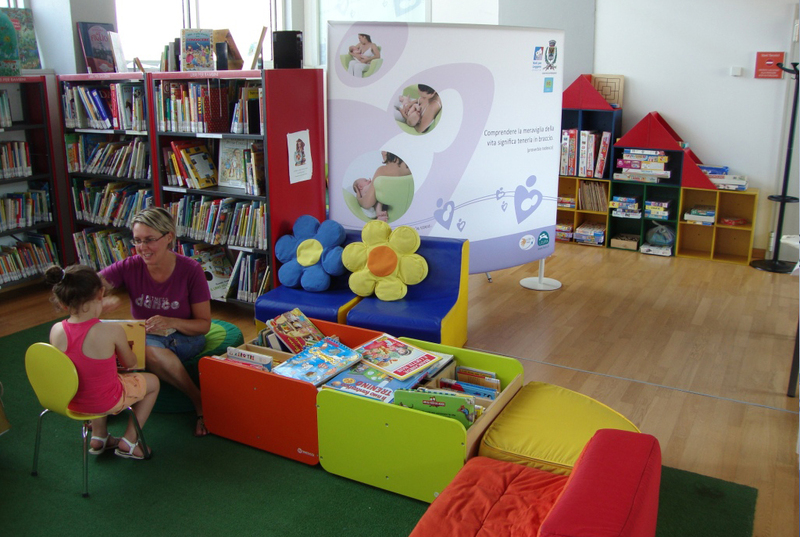 The attention to the mother and her child starts in the hospital and branches in all the places of life: pharmacies, libraries, parks, shopping centers, museums, airports etc ... MimmaMà Point conforms to directives of the World Health Organization and all requirements of UNICEF Baby Pit Stop, ensuring the Right to Health of Mother and baby. 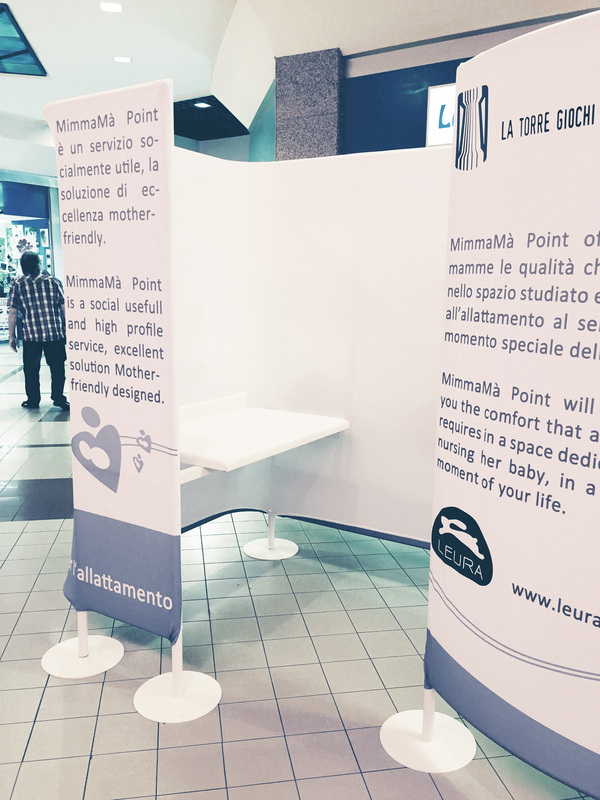 MimmaMà Point has the label Designed for You&All for its innovation, aim, shared support with other partners and for its qualified equipment . 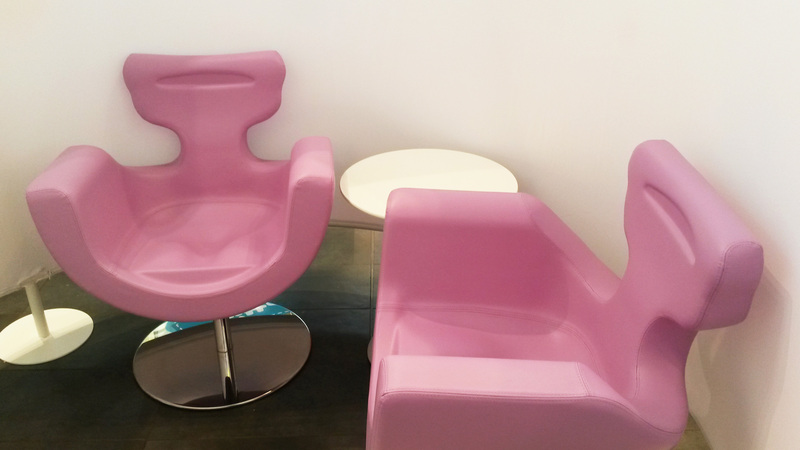 Leura offers continual and flexible service. 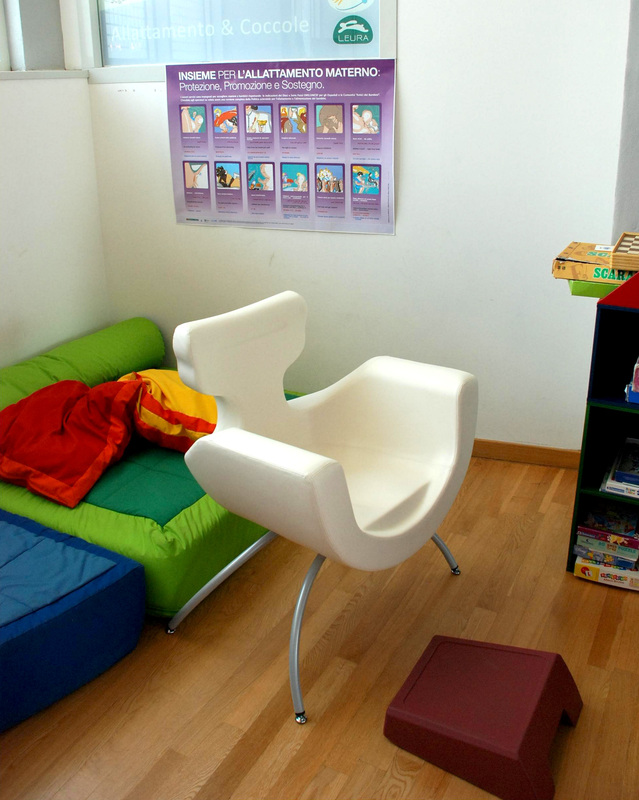 Architect Mitzi Bollani offers her consultancy to encourage the best solutions for realizing special living spaces which will enhance the quality of the motherbaby relationship in such precious moment.